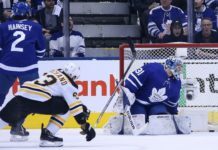 Mike Babcock addressed the media after his team’s 3-0 loss to the Nashville Predators on Tuesday night, the Leafs’ fourth loss in their last five games. I really liked our game. I thought we worked hard. I thought we played well defensively. I thought we tracked. I thought Pekka Rinne was really good. I didn’t think we gave up much. It’s a game you’d like to win because you thought the team put in the effort and did things right and stayed patient. To me, it is just a process. If you do good things, good things happen. This was a real good step for us, especially after the week we just had. We worked. We tracked. We stopped on defense. We were inside. We did everything right. Now, we also were chasing the game. It is easier to play right when you are not chasing the game. I thought our guys started good and I thought we played good. Obviously, any time you’ve been through a tough week… I mean, it’s been a tough week for our team here. I am not trying to pretend we didn’t have something to do with it. We did. But still, when you are on the goalie, you want to get back on track and get feeling good about yourself. He is a key, important player for us and a big leader for us. We need him feeling good, so tonight is a good step. Shoot it in the net. We generated and I thought we had some good looks. I thought Pekka Rinne made some real good saves. They’re a good team. They’re a deep team. They’re deep enough that they don’t have to overplay their players. I thought they played solid tonight but I thought we did as well, too. I was pleased with our effort. I would’ve liked to have seen us score.